Bhai Kanhaya Ji NSS Department of Desh Bhagat University organized a Voter Awareness Drive 'I Pledge to Vote' and Signature Campaign at the campus. The event was arranged to educate and encourage the people, especially the youths to exercise their voting right. University Chancellor Dr. Zora Singh presided over the event and said that Vote Casting is the right of every citizen and everyone who is of 18 years of age must use this right. 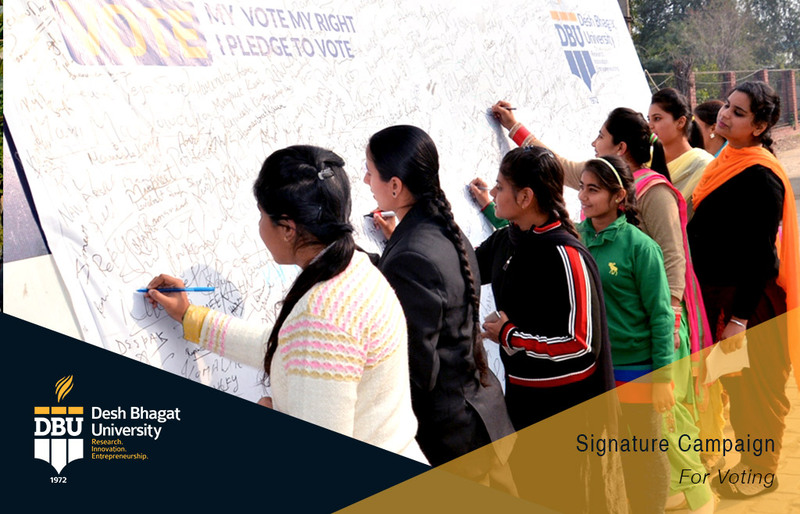 While signing the pledge for vote he said that every citizen must vote in Punjab assembly election and make sure of their contribution to the society by electing suitable candidates. 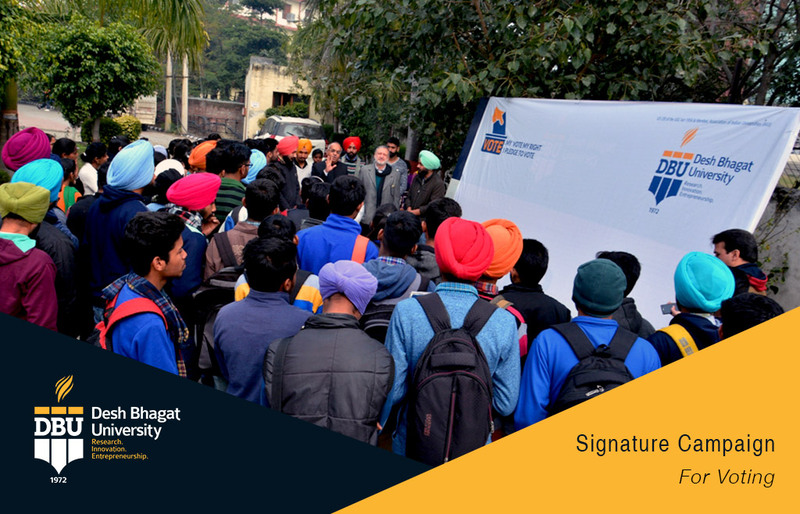 Vice Chancellor Dr. Virinder Singh motivated all the students present on the occasion to take a pledge to exercise their voting right. 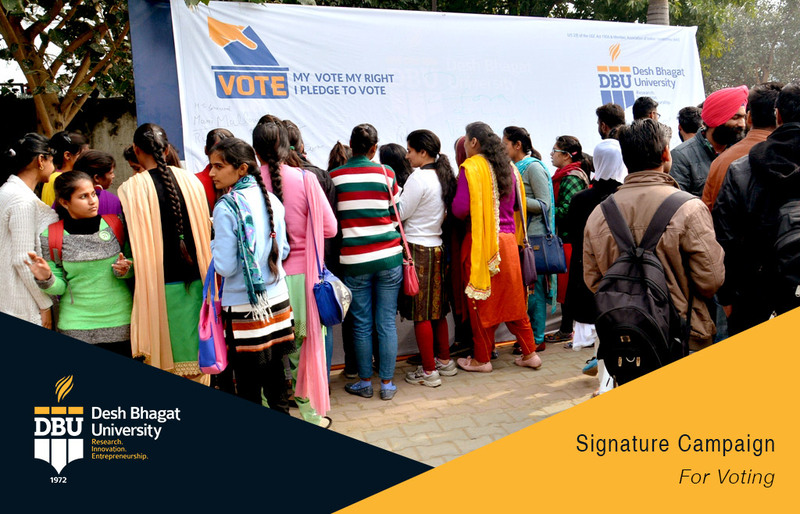 The students and staff members of the university showed great enthusiasm and participated in this awareness drive and pledged to cast their votes. 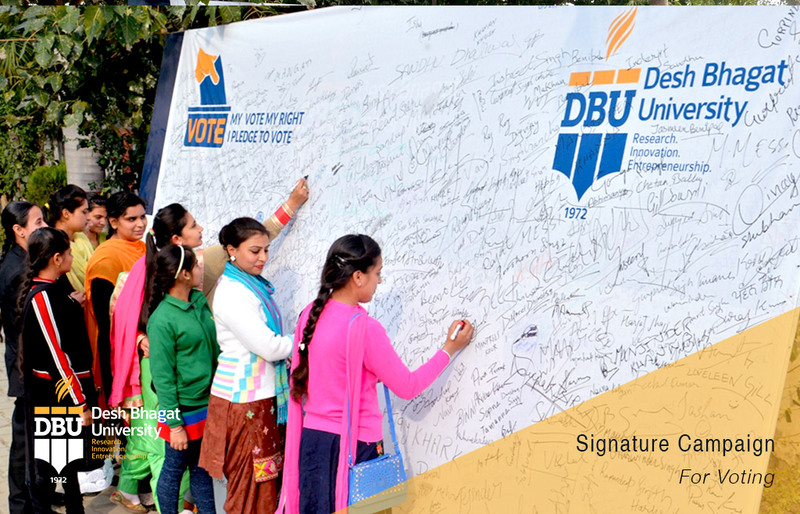 The awareness drive and signature campaign got overwhelming response and within few hours, the whole signature board was filled with the signatures of the students and the staff. The students who are going to exercise their vote for the first time were looking particularly excited. As a part of this awareness campaign, NSS volunteers visited surrounding areas to make people aware about the importance of their vote and exhorted them to inevitably cast their vote. Appreciating the initiative, Pro Chancellor Dr. Tajinder Kaur said that our country is the largest democracy in the world and now it's the turn of our youth to cast their votes and give a direction to the country. On this occasion, and Pro Vice Chancellor Dr. Neelima Jerath and Vice President Desh Bhagat United Er. Sandeep Singh said that our youth should not only cast their own votes but also motivate others to come forward to exercise their right to vote. Directors of different Faculties and staff members were also marked their presence on this occasion.